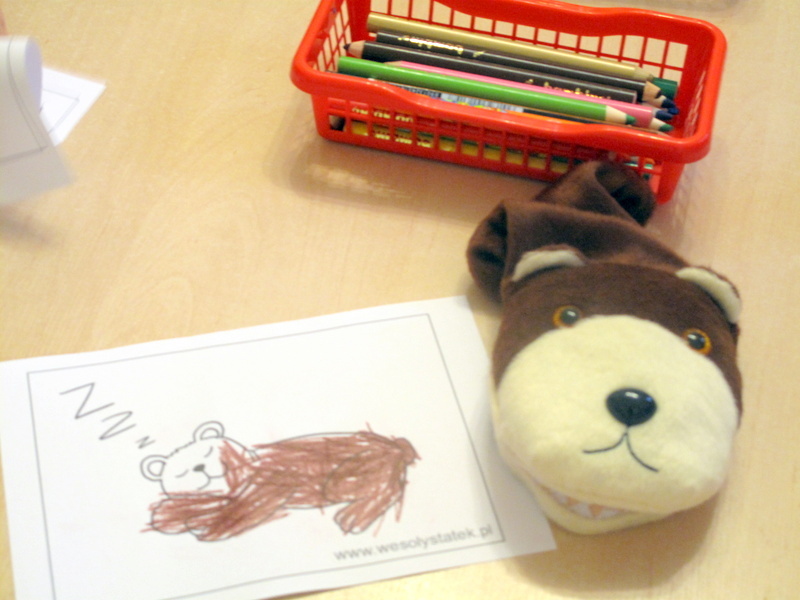 Speech therapy activities for preschoolers can be fun and engaging, especially if a speech class is run by a teddy bear! We present a free scenario of group activities for such a class. The main role is played by the Bear Moowi puppet – a speech therapist assistant who will lead the tongue gymnastics with pre-schoolers. 2. Talking about animals living in the forest and welcoming the Bear puppet. The bear wakes up and yawns widely (we imitate yawning). From the very morning its stomach is growling (we vibrate with our lips), so it is going to search for honey. It looks left and right (we move our tongue from the right-side to the left-side corner of our mouth). Then it tries to sniff the honey (we inhale with our nose and then exhale through our mouth). It has smelled where it is and runs to the tree hollow where wild bees live (we move our tongue to the upper teeth and then down to the lower teeth). The bear is salivating (we smack our lips). It puts his paw into the hollow and licks the honey (we imitate licking). It has the honey on its mouth (we lick our lips) and teeth (we wash our teeth with the tongue). The bear is full so it purrs with satisfaction (mmm….) and it goes to sleep (we imitate snoring). 4. A breathing game – we rock the bears on our belly. Each child chooses a mascot, puts it on his/her stomach and “rocks” it (diaphragmatic breathing). 5. A moving game – bears and bees. Children are divided into two groups and imitate bears, stomping and puffing, and bees, “flying” and buzzing. 6. A language game – we find descriptive words for the bear. 7. Manual exercises – colouring the picture of a teddy bear. Have fun :). And if you need a bear to run your group speech therapy activities for pre-schoolers according to this scenario, you can buy one here.